Death Doulas: what is their role and what is happening in Hawaii? Laura Miner, Certified Thanatologist and End-of-Life Midwife, is a member of ADEC, Association for Death Education and Counseling and INELDA, International End-of-life Doula Association. In June, the National Hospice and Palliative Care Organization, the leading hospice and palliative care membership organization in the U.S., announced the formation of a Council to provide information and resources to its members, affiliated organizations, and the public regarding the role of end-of-life doulas. Please join Laura as she discusses the ‘Death Doulas’, her experience in April at the International Death Doula Training on Maui, and ‘Alive for Now: Using Death to Thrive in Life’, a workbook and educational tool written by her colleague and friend, Jessica Murby. Parking is $3 for 2 hours in the two lots in front of the church. 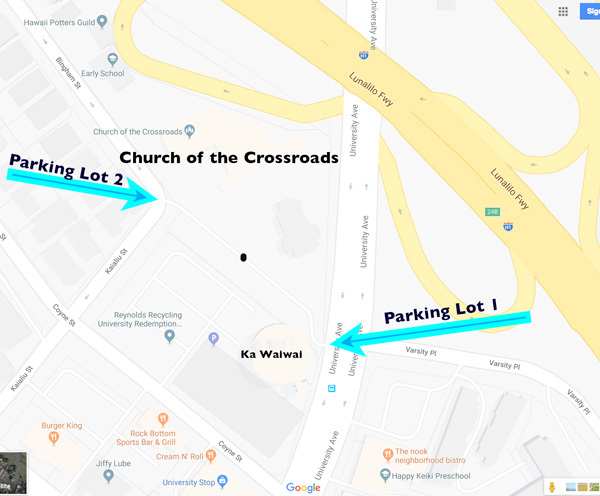 You can enter either of University, right mauka of the Varsity building, or off of Bingham Street, since these are two separate lots. We will end a bit early so you can stay under the 2 hours. There will also be updates and a chance to learn, laugh, mingle and network. For people who cannot join us in person, please send Jeannette an email to get the handouts. Hope to see you all there! We have between 20-40 people in each meeting and need a space where we can show slides and that has easy parking. Not only would you be helping out Kōkua Mau, it is a great chance to see the amazing people of our network and get easy access to the excellent speakers. Contact Jeannette with your suggestions! Many thanks to St. Francis for hosting for many years but their campus renovations means the meeting rooms are no longer available.